- APS is Active Phase Switching, that is complete function to Control Power Demand With Switcing Dynamically, it’s for CPU, Memory and Chipset PWM. GreenPower Technology is the Best efficient power saving solution for end-users. DrMOS offers lower temperature when it is working. No More Noise!! No More High Speed Fan!! bring the "Stable Overclocking Environment". Pros: Computer shut down with usb power still available. Tried to power it up it would not post. Reset the CMOS managed to get it working and then an hour later dead fans spinning. Rest CMOS again would not post. Pros: Looks like a good board. I used almost all its pcie and SATA ports and it was somewhat stable for almost a year. Cons: Shipped with one bad SATA port. Stability uses may have greatly contributed to the loss of an SSD drive and a 3 disk RAID 5 array. Other Thoughts: RMAed the board, hoping the boards gets tested, the SATA port repaired, and MSI's techs fix everything they can find that is contributing to the stability issues on the board. Also hoping the repaired or replacement board that comes back will actually work 100% correctly, with all ports intact, and that the returned items will be more stable in the long run and not something that will start experiencing significantly worse errors within a few months*. * I have gotten MSI RMA replacement boards before that have themselves died completely just outside of the original warranty. Hopefully the replacement will work as it's supposed to. Pros: Worked well with old Phenom II X4 955. Cons: So far the board is incompatible with the FX-8350 cpu. Downloaded latest BIOS (18.9) and it then at least would boot into the BIOS and run for 15-20 minutes under no load--then a black screen. MSI Tech support then sent me a beta BIOS, which helped keep the unit running for 90+ mins, but still locked up. Now waiting to hear if my mobo is still under warranty, as MSI apparently knows that some of their 890 boards will not run with the new the processors unless modified. 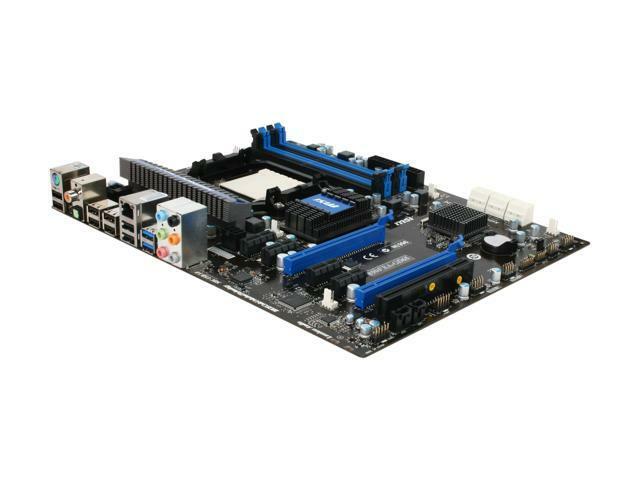 Other Thoughts: While I try to figure out how to RMA this mobo and get a modified one in return...I ordered a Gigabyte 990FXA-UD5! If you have any questions or concerns regarding the product, received the unit back from RMA but are still having issues, please do not hesitate to contact us directly at usreview@msi.com and we will be more than happy to assist you, thank you. Pros: Worked well for the first year. Then I started having boot problems and signal not getting to the monitor. Cons: RMA'd it. Got it back 2 weeks later. Worked for a grand total of 2 days. Computer kept freezing every 15 minutes. Now it is not even responding. I have a new CPU and Graphics card. I have tested everything and all signs point to the mobo being dead. I am not getting any signal to my monitor and it is distressing that I paid a lot for shipping to get the exact same mobo back with all its faults. It is not working after it froze my system and crashed. Other Thoughts: I got a new motherboard that fits my CPU. It works a million times better without all the headache. Do yourself a favor and if you still have this mobo just replace it and get a new one. It will cause way too many problems down the line. It worked well for when it did. But now it might as well just be a door stopper. Sorry MSI I liked your other products but this motherboard was just terrible. Cons: This board has some weird setting called "Cool and Quiet" in the bios. That needs to be turned off or the MoBO will shut itself off when it reaches a certain temperature. It is in the advanced cmos setting section I think. Once I turned that feature off,, it did not do the seemingly random shut offs anymore until I upgraded the BIOs and that feature was turned back on by default. I do not understand that feature or why it was there, or why it was so sensitive. **Note** If you do this, you may want to buy and install a stronger CPU cooler. I installed the Cooler Master V8 and it keeps the CPU cool enough for me to feel comfortable. Other Thoughts: I think there should have been a mention about the Cool and Quiet feature in the trouble shooting with solution of turning it off if the motherboard shuts down unexpectedly. Pros: Worked solidly when I first bought it and didn't look into it until I started getting shutdown issues like everyone else has been complaining about. Cons: The shutdown problems are starting to get worse and worse and I didn't know this board had been discontinued until just recently. Starting to think it is hurting other parts though because my screen and keyboard go off while the system stays on. So I'm forced to flip the switch in the back to actually shut it off. Pros: This board looked great on "paper" and performed great the first few months I had it. SATA III and memory channels seem to work fine. Cons: Many flaws. I have had random blue screens and freezes, happens once a month or so. All my other hardware is just as old as the motherboard and has been tested separately, and I have narrowed it down to the mobo. Have upgraded CMOS already with no changes to the random lockups and blue screens. Every time I shut my computer off, my speakers emit loud static for 1-2 seconds. So the onboard sound is junk too. Could not overclock my AMD Phenom II X6 1090t even a little. Could not run stably. AMD chip runs hot on this board for some reason. Other Thoughts: I'm disappointed in myself for buying this board. I will never buy MSI again, after getting the 6950 Twin Frozr and having that temp high as well. Just in case you're wondering, it's not an airflow issue, I am running Scythe Ultra Kazes and have tried the side panel off too. Will probably buy an ASUS to replace this board. Big disappointment, especially for the $150 I paid for it. Stability issues can be caused by various of factors and it could be multiple causes.